Aesara of Lucania (Αἰσάρα) lived some time during the period 425 B.C. to 100 A.D. An analysis of the language in which she wrote suggests that she is either a “late Pythagorean” (roughly, from the time of Plato), or that she is a “Neo-Pythagorean” (roughly, from the time of Christ) who is attempting to write in an antiquated language and style. Only a fragment of her work On Human Nature has survived, preserved by the early encyclopedist John of Stobi (Stobaeus, Florilegium, I.49.27). The fragment is written in Doric prose characteristic of the 3rd century BC or earlier, although that doesn't exclude the possibility that it was written later in an archaic style. It has been argued that the fragment is a Neopythagorean forgery dating from the Roman era, but no evidence is provided for this claim. Moreover, this claim implies that there was an earlier Pythagorean philosopher called Aesara of Lucania whose views were worth imitating. Other scholars have suggested that the fragment is pseudonymous and comes from a textbook produced by one of the dissenting successor schools to Archytas of Tarentum of Italy in the 4th or 3rd century BC. But there is no evidence for that claim either. In the absence of any strong evidence supporting either hypothesis, there is no reason to suppose that the fragment was not written by a woman philosopher called Aesara in the 4th or 3rd centuries BC. 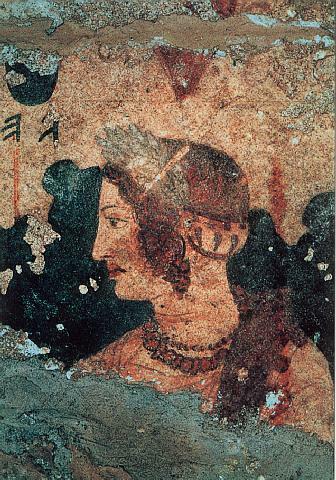 A fresco “Lucanian Woman” allegedly depicts her, or, an artist’s imagination of what she looked like. It is reproduced here. This Philosopher is featured in Busted!! DVD Volume 1, available through membership at the level of Philosopher-Queen and Salon. It has been argued that Aesara of Lucania believed that "through the activity of introspection into our own nature... we can discover not only the natural philosophic foundation for all of human law, but we can also discern the technical structure of morality, positive law, and, it may be inferred, the law of moral psychology, and physical medicine." This view, it is argued, provided the foundation for her intuitive natural law theory, which can be found in the surviving fragment of her Book on Human Nature. Aesara's most remembered philosophic feature was her tripartite soul, containing the mind, spiritedness, and desire. Mind was the center of judgment and rational thought. Spiritedness was the oasis of strength and ability. Desire was that part of the soul from which love, friendliness and kindness flowed. This tripartite soul is similar to that described by Plato in The Republic. Aesara applied her tripartite view of the human soul to the ideals of law and justice and said that their structure and ideal functioning corresponded to the structure and functioning of the human soul. "Being threefold, [the human soul] is organized in accordance with triple functions: that which effects judgment and thoughtfulness is [the mind], that which effects strength and ability is [high spirit], and that which effects love and kindliness is desire." Human nature seems to me to provide a standard of law and justice both for the home and for the city. She argues that no one of these parts of the soul ought to dominate, and no part can be dispensed with. Rather, depending upon the nature of the action, the corresponding part of the soul ought to dominate the others, reigning them in, relative to “the thing to be done.” For example, if I must choose which food to eat and how much of it to eat, Desire will dominate. If I desire beef, I will choose either a small portion or a large steak. But Reason will rein in my appetite, so while giving in to the desire to eat beef, reason will tell me that the fat and cholesterol in the steak are excessive threats to my health, and that I ought to choose a small portion. Spiritedness is the part of the soul that gives me the strength to accommodate my desire in a way that has been mediated by reason, rather than going for the steak. All three parts of the soul are involved in each decision, but the part that dominates depends upon the task at hand. These things are the rational, mathematical, and functional principles at work in the soul. Aesara's theory of natural law concerns three applications of morality, concerning the individual and the family [home], and for social institutions [the city]. The Pythagoreans were notable as a philosophic community for including women in their ranks. This did not necessarily equate to modern ideas of equality; they believed that women were responsible for creating harmony and justice in the home, in the same way that men had the same responsibility towards the state. Seen in this context, Aesara's theory of natural law is fundamental to justice and harmony in within the individual, in the family, and in society as a whole.